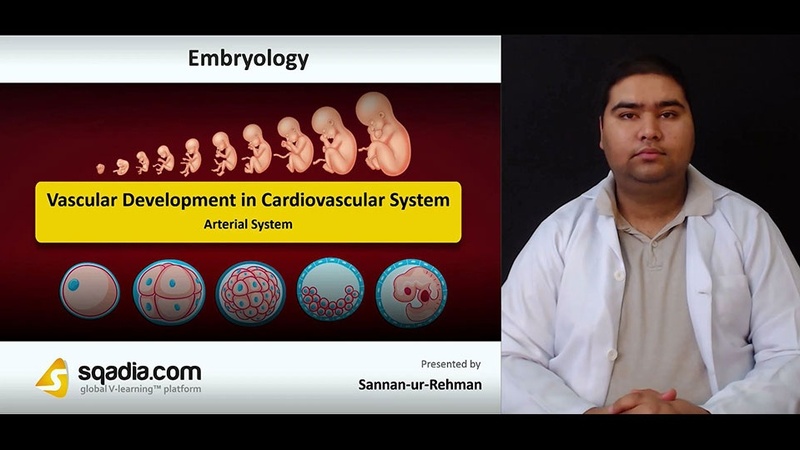 This lecture addresses the topic of Vascular Development in Cardiovascular System. In section one, the educator imparts detailed information about Aortic Arches. First of all, the Mechanism of Vascular Development is highlighted. The educator then comprehensively introduces Aortic Arches after which light is shed on Neural Crest Cells and Aortic Sac. Furthermore, the status of development of Aortic Arches on Day 27th and Day 29th is discussed. The educator then reports Transformation of 3rd Aortic Arch, Transformation of 4th Aortic Arch, and Transformation of 6th Aortic Arch. Subsequently, description of Important Alterations and Recurrent Laryngeal Nerve is carried out. In section two, the Arterial System is explained. Light is shed on Vitelline Arteries after which the Umbilical Arteries are highlighted. Following this, the educator speaks in detail about Coronary Arteries and Cardiac Neural Crest Cells. Apart from this, the educator deals with the elucidation of Patent Ductus Arteriosus, Coarctation of Aorta, and Abnormal Origin of Right Subclavian Artery. Moreover, the Double Aortic Arch and Right Aortic Arch are brought under consideration followed by an elucidation of Interrupted Aortic Arch. Section three is about the Venous System. After giving an Introduction of Venous System, the educator talks extensively about Vitelline Veins. Moreover, light is shed on Umbilical Vein and Cardinal Veins. Afterwards, the educator elaborates on Vena Cava System. Section four is regarding the Clinical Correlates and Lymphatic System. In the start, the educator focuses on the description of Double Inferior Vena Cava. Subsequently, the case of Absence of Inferior Vena Cava is brought to light followed by an elucidation of Left Superior Vena Cava and Double Superior Vena Cava. At the end of this section, the Lymphatic System is extensively discussed. The prime focus of section five is the Circulation Before and After Birth. The educator explains the concept of Fetal Circulation in the beginning. Moving forward, Blood Mixing Sites are elucidated. Subsequently, the topic of Circulatory Changes at Birth is addressed by the educator.